Modern medicine is a wonderful thing, but it can only do so much. And with chronic disease now more prevalent in the Western world than ever before, it is becoming increasingly apparent that many of the answers to our health lie elsewhere. Alternative medicine is quickly gaining ground in the American health scene, and one traditional form of medicine shines brighter than the rest: Ayurveda. To call Ayurvedic medicine “ancient” is probably something of an understatement. Archaeological records indicate that Ayurveda evolved in tandem with the development of civilization on the Indian subcontinent, with its roots dating at least as far back as 5000 BC. Over the millennia, careful observation and medical experiences were passed down from generation to generation, with that combined wisdom eventually coming to form the core written dictates of Ayurvedic practices we see today. And as the Western world begins to turn its attention to Ayurveda, many of the problems which modern medicine failed to solve are now being addressed. Ayurvedic rituals embrace the individual as a whole, seeking to balance the mind, body and soul as the key to true health and happiness. By aligning our energies and living consciously under Ayurvedic principles, we can begin to address those chronic health problems and step into a calmer, more nourishing world. Here are seven ancient Ayurvedic healthcare rituals you can do today, to get your health back on track tomorrow. As a nation, we’re horribly under-provisioned when it comes to sleep. Most of us don’t get nearly enough sleep each night; a phenomenon that’s accepted within society as it’s supposedly more important to work than rest. Ayurvedic principles place great value in sleep, recognizing that it is critical for repairing damaged cells, building new ones, restoring balance and resting the mind. And incidentally, this is something that the scientific literature very much confirms. A 2004 study published in the International Journal of Neuroscience, for example, showed that sleep deprivation significantly delayed wound healing in rats. Another study showed that sleep not only helps to “retain salient memory traces,” but it can also help to stave off diseases like Alzheimer’s and autism. Make this Ayurvedic teaching your number one priority, and you’re bound to see improvements in your health. This next Ayurvedic healthcare ritual might seem like it spits directly in the face of the first one, but there’s no reason why you can’t get a great night’s sleep and rise before the sun does! Ayurvedic wisdom believes that waking an hour and a half before sunrise every day helps to consolidate one’s circadian rhythm, making it easier to feel wakeful during the day and sleep easier at night. So, go to bed early, and get up early — it’s really not that hard! And when you rise before anyone else does, you can use that time for inner reflection and personal development. That’s time well spent, in anyone’s book! If you’re anything like me, you recognize the importance of meditation but often find it hard to fit into a busy day. 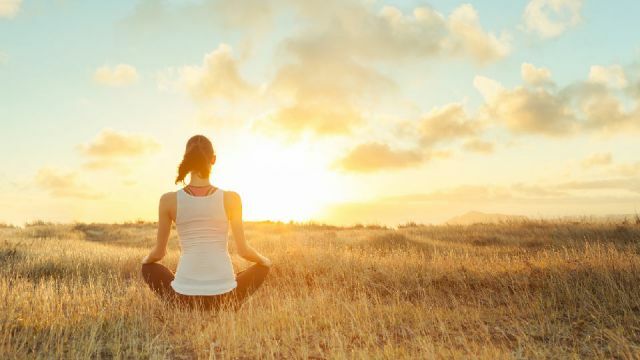 Ayurvedic healthcare suggests that the morning is the best time to meditate…especially if you adhere to ritual number two, and get up well before the sun does! Meditation works best when there are no distractions — and hands down the quietest, most peaceful part of the day is in the early hours before the rest of the world wakes. Making morning meditation a part of your daily ritual will provide countless benefits, including a sharper mind, less anxiety, more confidence and more empathy for the people around you. Ayurvedic healthcare is big on bathing, especially in the morning, so why not follow up your morning meditation with a gloriously relaxing bath? Ayurveda believes that bathing in the morning helps to revitalize and heal the body by relaxing the muscles, unclogging blocked pores and restoring moisture to dehydrated tissues. And if you sprinkle a little bit of magnesium-rich Epsom salt into your bath, you’re bound to start your day feeling like the very essence of chill. These days, few would argue that the humble ginger root is something of a superstar in the alternative health world. Ayurvedic teachings agree, suggesting that brewing a nice cup of hot water, ginger and raw honey and sipping it before breakfast can help to kickstart your digestion, nourish sleep-starved cells and hydrate you in the best way possible. The concept that exercise is good for us is nothing new, but making it a part of your Ayurvedic healthcare rituals will ensure you’re constantly reaping the rewards. Ayurveda maintains that different people benefit more from certain types of exercise than others, but any form of movement will help to reconnect and re-balance your mind and body. Full-body exercises like yoga that combine gentle movement with controlled breathing are particularly Ayurveda-friendly, and can count towards your morning meditation too! As a nation, we’ve become woefully disconnected from the ground we walk upon. Every day, we encase our feet in socks and protect our soles with thick rubber, thereby preventing our feet (and bodies in general) from coming into contact with the earth. Recently, the practice of “grounding,” otherwise known as “earthing,” has become popular in the alternative health community, and it’s very much in line with Ayurvedic daily healthcare rituals. Whipping off your shoes and socks and making a point of walking with your bare feet on grass, sand, dirt or even water every day helps to offset the pent-up energy your body accumulates from exposure to electronics and other modern accouterments. It’s no joke: studies show that removing that insulative layer around our feet and making direct contact with the earth significantly and measurably lowers the amount of circulating static electricity in our bodies. And that means better sleep, less stress and improved health in general. Hey Buddy!, I found this information for you: "7 Ancient Ayurvedic Health Care Rituals You Can Do Today". Here is the website link: https://www.thealternativedaily.com/7-ancient-ayurvedic-health-care-rituals-you-can-do-today/. Thank you.